Lightly whip the eggs and combine with the oil and water. Use a wooden spoon to mix the brownie mix and flour until well combined. Add the chocolate chips and mix once more. Pour tablespoons of the mix over a cookie tray and bake at 350°F for 9 to 11 minutes. Cool the cookies on a rack. For the frosting: Beat the butter, peanut butter, vanilla, milk and sugar in a large bowl until it becomes spongy. Once the cookies have cooled, cover them with the frosting and serve. You can use nuts instead of the chocolate chips. Most kids really enjoy making cookies with their parents. Here is a recipe for brownie cookies with peanut butter frosting that is perfect to make with your kids. 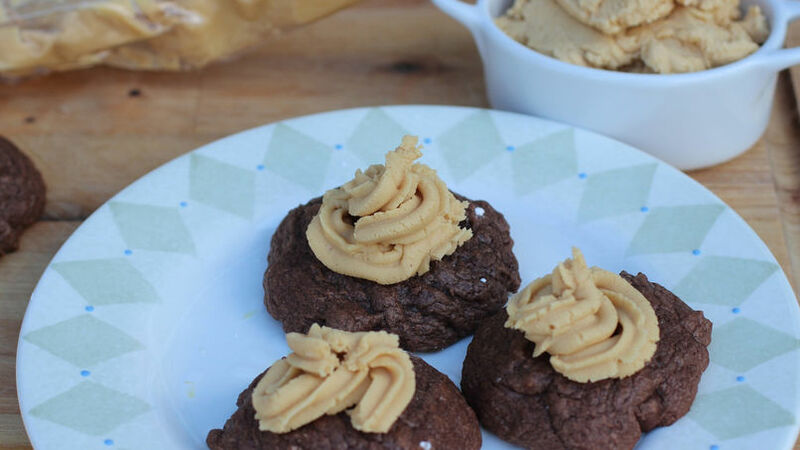 This recipe is simply the perfect combination of super soft brownie cookies with creamy peanut butter frosting. These cookies are the perfect treat for people who love this combination. The peanut butter frosting is addictive and mouthwatering. My husband and I alone ate half of the peanut butter frosting by the spoonful!